Not only do I love to cook and be in the kitchen, I really enjoy trying new recipes. I love browsing online for ideas, watching cooking shows and breaking in new cookbooks. I find it to be the best way to broaden my culinary knowledge and expand my recipe repertoire. Once I try a new recipe, I evaluate what I like and don’t like, then make a note of what I’d do differently next time I make it. That allows me to make modifications that better suit my (and my husband’s) tastes and also add a touch of originality to the recipe. One of my latest cookbook obsessions has been Plenty by Yotam Ottolenghi. It’s a vegetarian cookbook, but the author is surprisingly not a vegetarian. Most of the recipes are so unique and far from anything I’ve ever made before; I think that’s the main reason I love it. It’s really opened up my eyes to a new way of thinking about vegetables. I’ve learned how to transform a vegetable into a main course and prepare them in ways that taste delicious and make you forget you aren’t eating meat. 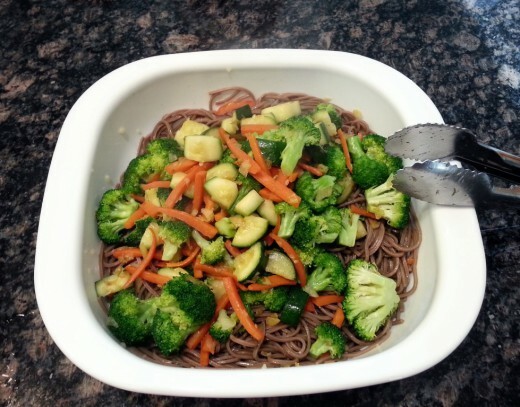 I recently tried a recipe from Plenty called Soba Noodles with Eggplant and Mango. I’ve tried eggplant numerous times, thinking that I will eventually enjoy it, but unfortunately it’s a vegetable that I just don’t care for. I think it’s the texture that gets me. 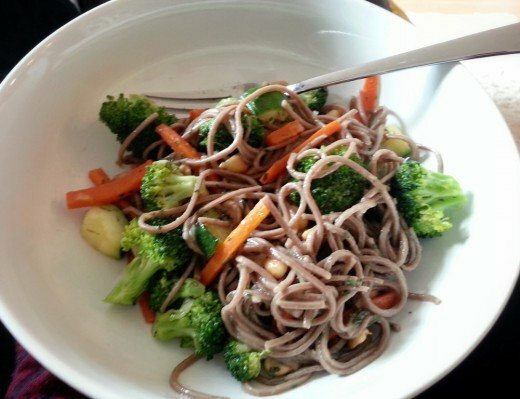 Anyways, even though it’s not my favorite, I decided to give it another honest try in the soba noodles. The dish itself turned out really well. The unique flavors melded together to create a taste very unfamiliar to me, but very good. The sauce on the noodles was incredible: rice vinegar, sesame oil, lime, and seasonings. Not to my surprise, I didn’t love the eggplant. I made a note to myself that next time I make this, I’m going to use chicken or shrimp instead of eggplant, and maybe leave out the mango. Last week was attempt number two at this recipe. The funny this is, I decided to not use either chicken or shrimp. Instead, I had a lot of fresh vegetables on hand in the fridge that sounded more appetizing at the time and turned out to work very well in the dish. The one constant between the original Plenty recipe I tried and the recipe I’m sharing with you today is the sesame lime dressing used to coat the noodles. It was so good that I didn’t want to make any modifications. So thank you Yotam Ottolenghi for the great dressing recipe! Begin by pulling out a cutting board to do some chopping. 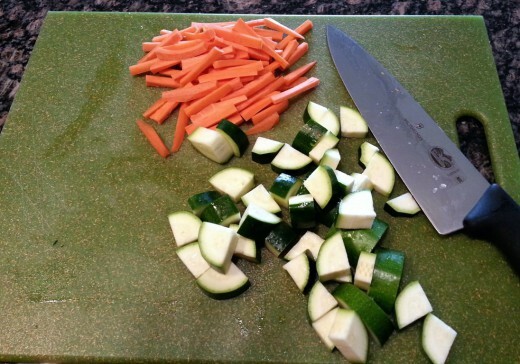 Peel and Julienne 2 carrots, dice 1 zucchini, and finely dice half of an onion. 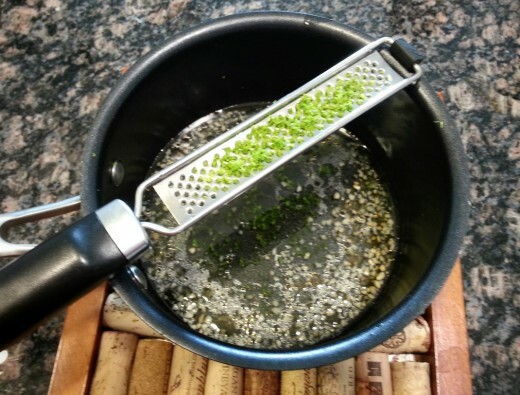 Wash a head of broccoli and cut it into small florets. 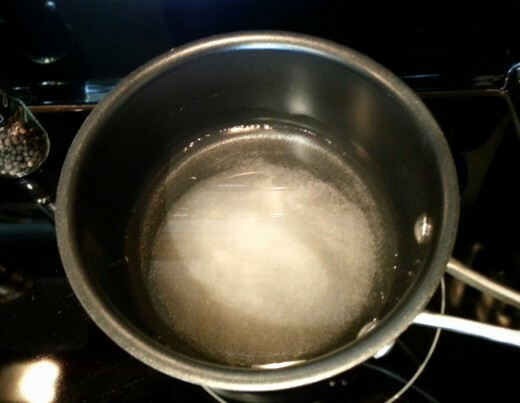 Before cooking the vegetables, bring a pot of salted water to a boil. 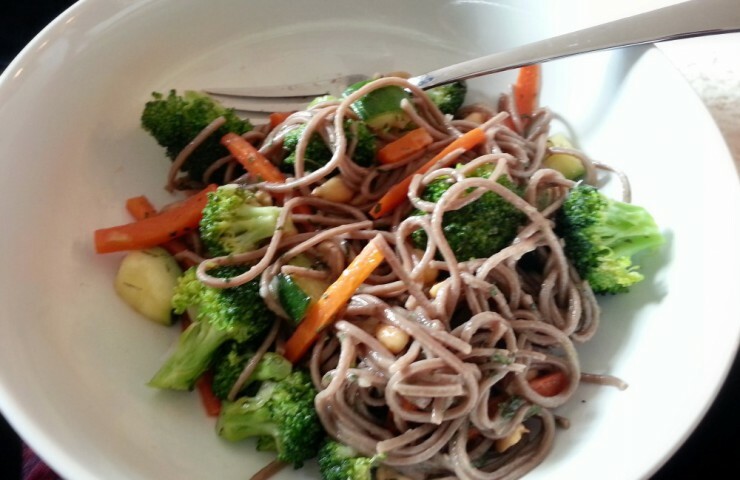 Add the soba noodles and cook for 6 to 8 minutes, until al dente. Transfer the noodles to a strainer and rinse and strain them. Set aside while preparing the remainder of the dish. Heat olive oil over medium heat, then add the carrots and saute about 3 to 4 minutes. 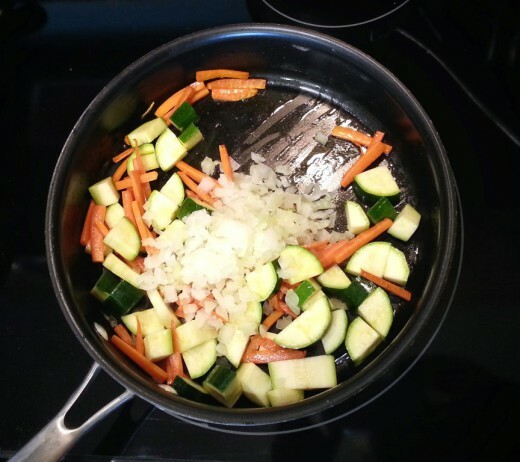 Add the zucchini and continue to saute for an additional 3 to 4 minutes. Add the diced onion and cook for 2 more minutes, or until the vegetables are cooked to your liking. I prefer to eat vegetables that aren’t too soft and have a bit of a crunch; if you like them softer, you may need to cook them a few extra minutes. 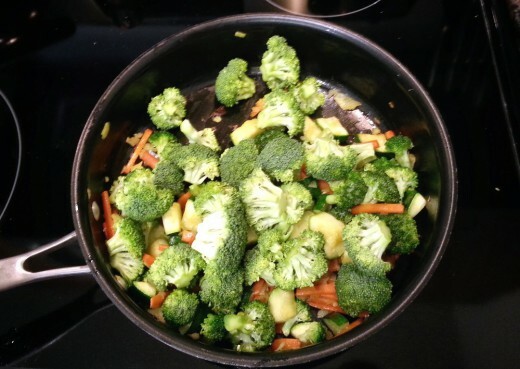 Throw in the broccoli, give it a quick stir, then cook just until it turns bright green. 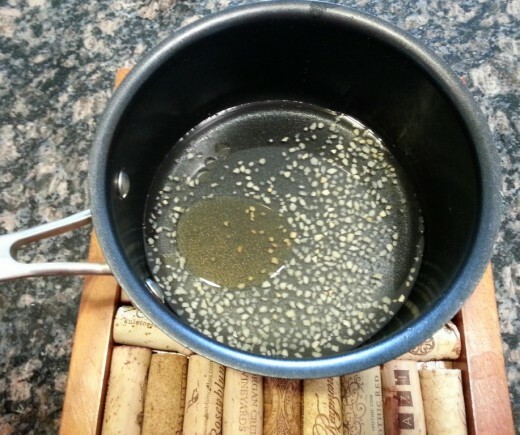 In a small saucepan, heat the rice vinegar, sugar and salt over medium heat. Stir and heat until the sugar and salt are completely dissolved. Remove the saucepan from the heat and add in minced garlic and sesame oil. Let it cool for a few minutes. Zest 1 lime, then squeeze its juice directly into the saucepan. Stir well to combine. 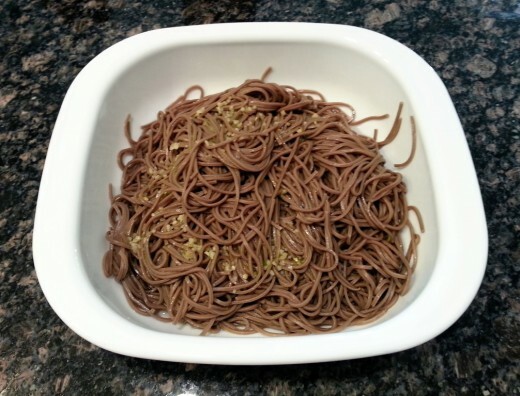 To assemble, transfer the soba noodles to a serving dish. Slowly pour the sauce directly on top of the noodles. Use tongs to toss the noodles and distribute the sauce. Add the cooked vegetables to the noodles, then use the tongs again to give it all a quite toss. Finally, add in the peanuts and toss one last time. To serve, sprinkle the noodles with cilantro, additional lime juice and/or a few extra peanuts. Enjoy hot or cold! Bring pot of salted water to boil. Add soba noodles and cook until al dente, about 6-8 minutes, then strain. While the noodles are cooking, prepare the vegetables. 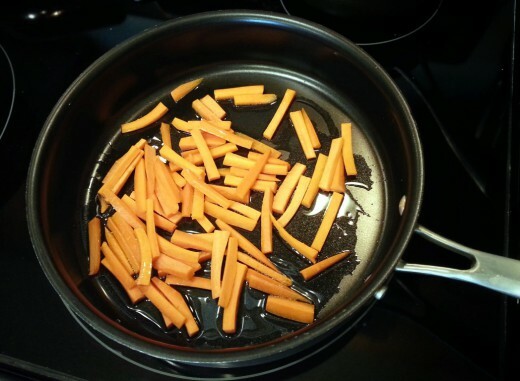 In a large pan over medium heat, add olive oil and carrots. Saute about 3-4 minutes. 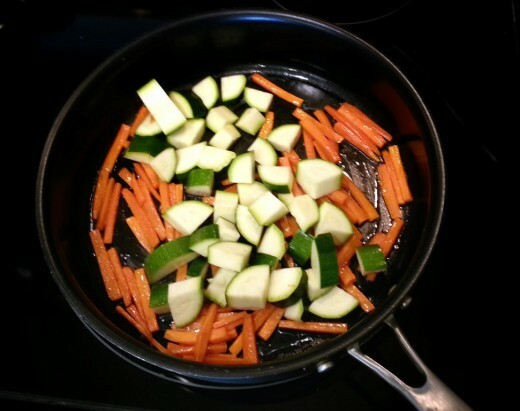 Add in zucchini and continue to saute another 3-4 minutes, stirring often. Add diced onion to the vegetables and cook another 2 minutes, or until the vegetables are cooked through and somewhat soft. Toss in broccoli and cook until it turns bright green; it'll only need a couple of minutes. While the vegetables are cooking, heat rice vinegar, sugar, and salt in a small saucepan over medium-low heat. Stir until the sugar and salt are completely dissolved. Remove from heat. Stir in garlic and sesame oil. Let cool a few minutes. Add in lime zest and lime juice and stir. 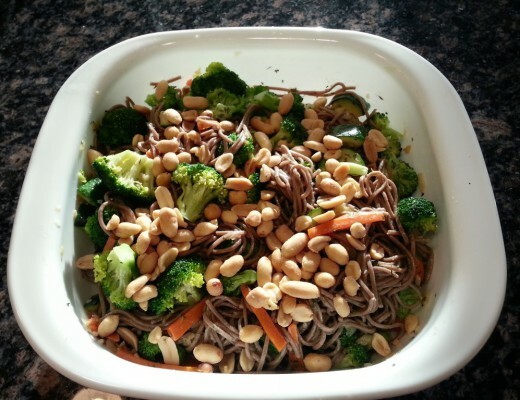 In a serving bowl, pour dressing over soba noodles and toss until well coated. Add in vegetables and toss again, then top with peanuts. Serve with fresh cilantro, extra lime juice and/or a few extra peanuts. Enjoy hot or cold.